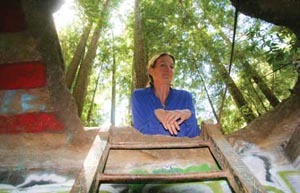 Science Communication Program instructor Martha Mendoza teaches the art of observation using UCSC's natural landscape. "Do you have the flashlight?" Martha Mendoza asked as she made her way through the forest, eucalyptus leaves crackling beneath her shoes. Her destination, a damp cave, was not far from the road. Mendoza (Kresge '89, journalism/education), a Pulitzer Prize–winning reporter for the Associated Press, teaches an investigative reporting class at UC Santa Cruz for graduate students in the Science Communication Program. Most lessons take place in a classroom. "But there comes a day in our semester when I tell them, 'Tomorrow, wear sturdy boots and be prepared to get muddy.' Usually they are mystified and excited," Mendoza said. For professors across the disciplines, the redwood-lined, rugged, and occasionally spooky campus is a vast resource. Taking advantage of the university's extremely unusual location, teachers are not afraid to have students cross creeks, dig through sticky mud, and get their hands—not to mention their pant legs—dirty. The setting and learning are inextricably linked. At the Center for Agroecology & Sustainable Food Systems, apprentices learn organic gardening and farming. At the UCSC Arboretum, which houses the largest collection of Australian and South African plants outside their native countries, students volunteer and pursue internships. Over the years, student interns have conducted archaeological excavations within the Cowell Limeworks Historic District. The land also inspires reflection and creativity; when College Eight lecturer Candace Calsoyas teaches freshman seminars on "Environment and Society," she leads students across the wooded campus while they walk, talk, and learn—a model that dates back to Aristotle, who founded the peripatetic school. "Though UCSC is exceptionally beautiful with its mountain perch, majestic redwoods, and textured seascape below, still every landscape and cityscape suits the 'walk and talk,'" Calsoyas said. "Unlike being in the classroom, students don't feel put on the spot and are more liberated by being outside." 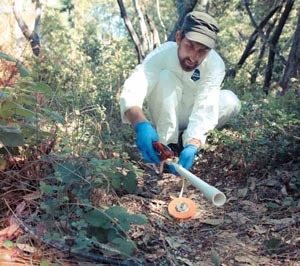 Over the years, UCSC's unique location has informed, enriched, and expanded the curriculum while allowing students to test their hunches and perfect their skills outdoors. "Oh, look," Martha Mendoza said as she paused in a clearing. "It's a deer. And oh, there's a fawn. And another! Last time we were out here, a lizard ran right over a student's foot. It scared her." Mendoza's experiential slogs are meant to help students learn to capture telling details on paper, even when they find themselves in unnerving places. "Part of the lesson is being in an uncomfortable situation and still being observant," she said. Gingerly, Mendoza lowered herself into the throat of the limestone cave, using a sturdy ladder. There were no sounds but Mendoza's breathing, the "droop-droop-droop" of an unseen water source, and the "smack" of her sunglasses, which fell off her face and landed in some dark corner of the cave. Several of the campus caves provide habitat for rare cave invertebrates, some of which are believed to occur only on campus. These species are likely sensitive to disturbance, and educational users are informed about ways to minimize impacts while taking advantage of the opportunity to teach amidst and about these unique and rare organisms. "A reporter has to be out of the comfort zone," Mendoza said as she turned on her flashlight, which only poked a hole in the dark. "If I'm in Haiti, reporting on exploratory drilling at a gold mine, and there's all this noise and people walking by with weapons, I have to really settle myself and say, 'What are these people wearing, and is it hot or cold out? What's going on?' Even if I had beautiful photos and video, it's just not the same as getting it down on paper in the moment." Erika Zavaleta, associate professor of environmental studies, uses outdoor opportunities in every course she teaches—even 350-person lecture classes. "UCSC has a huge diversity of ecosystems right on campus: mixed conifer forest, chaparral, grassland, redwood forest, riparian forest, streams, and of course agricultural lands," she said. "Where I grew up in the Northeast you would need to drive for hours to cross through this many kinds of ecosystems." Zavaleta takes an inquiry-based approach, giving students the chance to explore an area and wrestle with such questions as, "Are there more kinds of insects in the forest or the chaparral?" Students haul field guides, compasses, transect tapes, and nets into the field. Soon they've made graphs and drawn up posters to present to the class. "I hear them talk about what an exciting thing it is to think and problem-solve for themselves, and get out and actually do science rather than just hearing about it," Zavaleta said. "Just the simple experience of looking in the right places for salamanders and finding them, or of trying to figure out why the forest ends and the grassland starts right at a particular place, lights up so many students," Zavaleta continued. "They connect places with intellectual ideas and practical skills." The students of Grant Hartzog, professor of molecular, cell, and developmental (MCD) biology, take to the forest in search of bacteriophages, viruses that attack bacteria. So many exist in nature that they are thought to kill off a large proportion of bacteria on planet Earth every day. Still, students must prowl around in search of them. First they isolate the virus from the soil, photograph it with help from an electron microscope, and extract its DNA. Then a laboratory takes a close look at the DNA sequence. When it comes to phage hunting and genetic documentation, "you don't need an abundance of technical skills to be successful right away," Hartzog said. "You need to be enthusiastic, curious, and willing to learn." The result is original findings. "Every student is doing the same kind of technical manipulations, but each is collecting a unique virus," Hartzog said. "This means that although these beginning students are working together on similar projects, they are doing authentic research and making a real contribution. They take a project and have total ownership of it." They even get to name the newly discovered phages. So far, undergraduates have dubbed them Darth, FlowerChild, Haze, Jeffabunny, TreeBaby, Zigzag, Rage, Lugosi, DomoArigato, and Firecracker, among other names. One of Hartzog's students, Daniel McKernan (Oakes '14, human biology), quickly learned that some areas on campus are better than others for finding phages. "It is best to collect soil samples in damper shaded areas," he said. "I collected about 15 soil samples here on campus at UCSC in the dirtiest, muddiest, smelliest areas I could find. "The search was fun," McKernan said. "It took hiking in creek beds and digging through mud. It was interesting to go out in search of stagnant, wet soil." The next step was examining the phage using an electron microscope. "If the phage that I have isolated is novel, meaning that it has never before been discovered, I think I will name it after my dog, Broseph," McKernan said. In late summer, five student interns ventured out into the UCSC Campus Natural Reserve, 400 acres of protected natural lands on the 2,000-acre campus. They were heading out toward the 15-acre Forest Ecology Reseach Plot (FERP), a research and teaching site established by environmental studies professor Greg Gilbert five years ago. There, students and scientists have catalogued and tagged more than 10,000 individual plants, including Douglas-fir, coast live oak, Shreve oak, and tanoak. These students—mostly undergrads, but also a couple of newly minted UCSC graduates—are all paid interns, advancing science by helping with the FERP research project, spending eight hours a day, five days a week, in the forest. UCSC's caves are sensitive habitats that require careful stewardship by all. Appropriate use of the campus caves is limited to research and occasional guided visits for university classes, during which students are informed about ways to minimize impacts while taking advantage of the opportunity to learn about the area's unique geology and its rare subterranean organisms, according to Alex Jones, Campus Natural Reserve steward. Jones urges visitors to be sensitive to flora and fauna throughout the campus's natural areas, including its caves. "Caves on and around the UCSC campus provide habitat for rare cave invertebrates, including the Dollof cave spider and the Empire Cave pseudoscorpion, which are believed to occur only within these caves," Jones said. "These species and the caves' geologic features are vulnerable to disturbances caused by recreational use. Substantial degradation of cave features has been documented within the past few decades since their discovery." "There's nothing else like this in the UC system," said Gage Dayton, director of UCSC Natural Reserves. "You can learn a lot in the lecture hall or lab. But if you want to get a feel for what poison oak looks like, bang a hammer on a rock, dig a pitfall to trap and catch an animal, measure light penetration in a real forest, and capture and analyze water from a creek, you just can't get that in the classroom or a laboratory. And this is right outside our door." Getting students out to natural areas would have been logistically difficult and expensive "if you had to find buses for all of them," Dayton said. "But this is five minutes from the door of traditional classrooms. All students should be getting out here and using it." Along the way, the students get an intimate knowledge of how science works and best practices in research. They also have fun, making deliberately geeky jokes about "liking lichens" and sampling huckleberries straight off the vine. The huckleberries are of the same genus as blueberries, explained Alex Chacon, 19 (College Nine '15, plant science). "They're the worst plants to measure because of how bushy they are and how many stems they have." They insist that a visitor sniff a sprig of spicy wild mint and feel the contours of asmooth hazelnut leaf. They express sympathy for a western fence lizard that someone, perhaps a speeding bicyclist, has squished on the trail, and marvel at a strewn-about deer carcass. In the process, they grow their scientific skills hour by hour, day by day. "When you work on someone else's project you start seeing how scientists think," said Kathlyn Franco, 22 (Cowell '12, environmental studies), who wants to be a mammalogist. "You start seeing how they find and fix mistakes and how to find a better way," Franco continued. "You start building all these ways of seeing and doing. Gage [Dayton] will often answer my questions with questions: 'What are the drawbacks and benefits of doing this?'" To trek with these bright students through the reserves, past thick stands of chaparral, Douglas-fir, and madrones with peeling bark, is to see the campus landscape in a completely different light. At last they arrived at the FERP, where every single shrub and tree of a certain height and diameter is being studied. Considering this whole place is a living laboratory, it makes sense that the students suddenly stopped and put on what appeared to be lab coats. Actually, they were lightweight all-white Tyvek suits, designed to protect them from one of the plants they're studying— native poison oak. "Poison oak is very interesting," observed Catherine Scheid, 20 (Cowell '14, environmental studies), who has no fear of the nasty stuff. She may be immune. "It takes different forms. It can grow like a shrub. Sometimes it looks like a little tree." The students were accompanied by Alex Jones, UCSC Campus Natural Reserve steward. Student interns spend so much time out here with him that they've started to know the forest intimately. "A Cooper's Hawk nested here in the spring," Jones observed. "The female used to dive-bomb the interns. Now they're at the stage when we can hear three chicks begging for food."